We also offer discount tickets for sale to the Long Island Aquarium and Long Island Game Farm! Click here for more information. Who can reserve a museum pass? Adults, 18 years and older, with a Comsewogue Library card in good standing. How do I know whether to pick up or print out my pass? Library Pick-Up passes are highlighted in Blue. Print-on-Demand passes are highlighted in Green. Can I renew a museum pass? No, museum passes cannot be renewed. Cancel by calling the Circulation Desk at (631) 928-1212 ext. 0 or online at the Library’s museum pass software reservation page. (Click “My Passes”). Note that a cancellation made less than 24 hours before the pick-up date may result in a “no-show”. If you are unable to cancel online, please call the Circulation Desk. What if my museum is closed during the time I have a museum pass? You are responsible for planning your trip. Be sure to check the museum’s hours before you reserve a museum pass. When requesting a pass, you can click on the museum’s name which will then display admission details and a link to the museum’s website. The museum pass won’t cover my entire family. Can I request a second pass? No. The number of passes from a single museum is limited to one museum pass per household, every 30 days. How often can I reserve a museum pass? To ensure fair access to the greatest number of patrons, you can reserve a maximum of two museum passes of any type every 30 days. That is also the limit for households. You may not reserve the same museum more than once in a 30-day period. You may check out two passes at the same time as long as they are for two different museums. At our discretion, additional reservations made within 30 days will be deleted. Passes can be reserved up to 30 days in advance. Multiple copies made of the same Print-on-Demand pass will not be honored by museums. How were the museums chosen? The selected museums represent the diverse interests of our community and include offerings from the five boroughs and Long Island. To request a museum that isn’t on the list, please do so via the Library’s suggestion box. Does a museum pass grant admission to all museum-affiliated events/exhibits? No, not all events/exhibits are covered by a Comsewogue Public Library museum pass and additional fees are the patron’s responsibility. Please contact the museum directly for more information. How do I reserve a museum pass? Print-on-Demand passes must be reserved for the day you plan to use them and an email address is required for reserving. These passes can be reserved online, by phone, or in-person at the Children’s & Teen or Adult Services Desks, up to 30 days in advance. Passes can be printed from home at any time or at the library (during normal business hours). How long can I keep a museum pass? Print-on-Demand museum passes are only valid for the reservation date listed on the printed pass. They do not need to be returned to the library. What do I need to bring to the museum? You must bring your museum pass and library card. After reserving a Print-on-Demand pass you MUST print the confirmation page and bring it with you to the museum. This will serve as your pass. Electronic versions—on smartphones or tablets—will not be accepted by museums. Can I use the museum pass multiple times? No. Print-on-Demand passes are only valid for the date listed on the printed pass. They may only be used once. Museum passes can be reserved online, by phone or in person at the Children’s & Teen or Adult Services Desks. Choose from the available pick-up dates (not necessarily the date you are visiting the museum). If a pass has already been reserved, you will see “RESERVED” or “BOOKED”. How do I return my museum pass? Museum passes must be returned TWO HOURS prior to closing on the due date. It is the borrower’s responsibility to know library hours and to ensure that the pass is returned on time. Museum passes must be given to a staff member at the Circulation Desk. DO NOT RETURN PASSES IN THE BOOK DROP OR LEAVE ON THE COUNTER. What happens if I don’t pick-up my museum pass? If you don’t pick up your museum pass, the Library is not obligated to honor your reservation. A “no-show” will be marked on your account. Two “no-shows” within two months will result in reservation privileges being revoked for the next two months. Further disregard will result in reservation privileges being permanently revoked. Can I pick-up a museum pass without making a reservation? No, walk-ins are not permitted. Passes must be reserved prior to picking them up at the Circulation Desk. You must bring the museum pass and your library card. Can I use the museum pass multiple times while it’s checked out? How do I pick up my museum pass? Please call (631) 928-1212 ext. 0 before to ensure that the pass has been returned by the previous borrower. Passes are picked up and returned at the Circulation Desk. A valid photo ID is required along with the library card used at time of reservation. If you are picking up for a family member, you must live in the same household. 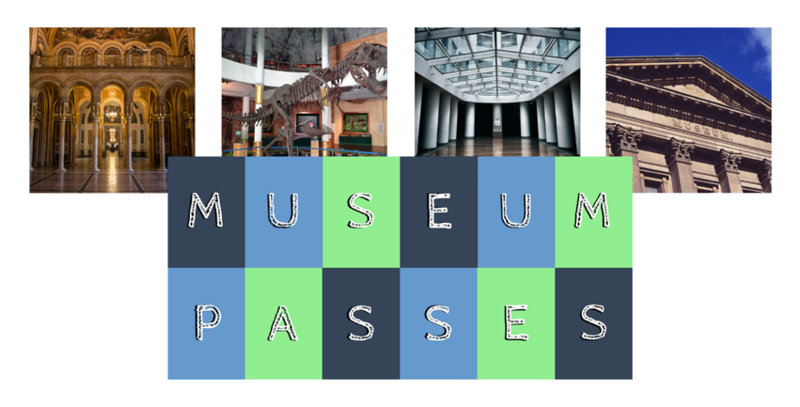 A Museum Pass User Agreement must be signed each time you check out a museum pass. What if the library is closed for a holiday/emergency? The library is closed on several days during the year; click here to see a list of scheduled holidays and closings. If the library is closed for an emergency on the due date, the pass is due back on the next open day. What happens if I lose or damage the museum pass or the travel pouch? As stated in our user agreement, if the museum pass is lost or damaged, you agree to pay a replacement fee equal to the full value of the missing pass as determined by the museum (up to $750). For the cost replacement list, please see the Circulation Desk. The replacement cost for the travel pouch is $4. What if I return my pass late? A late fee of $20 per day will automatically be charged to your account. Museum passes can be reserved online, by phone, or in person at the Children’s & Teen or Adult Services Desks. Choose from the available pick-up dates (not necessarily the date you are visiting the museum). If a pass has already been reserved, you will see “RESERVED” or “BOOKED”. The Library is not responsible and may not be able to honor a reservation if the pass you reserved is lost, returned late, or if the Library has an emergency closing. The Library reserves the right to monitor program usage to ensure fair access for the greatest number of patrons. By clicking “Accept”, I indicate that I have read and understood the above.